"Your Guaranteed 100% Unlimited Exclusive Appliance Repair Leads... Today! 100% Exclusive Appliance Repair Leads - NO Sharing Your Leads with Your Competitors. EVER!! 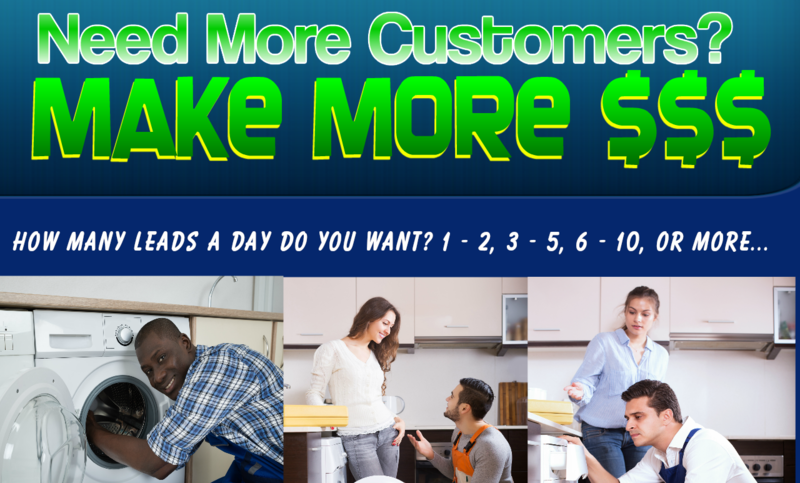 New Appliance Repair Leads (New Customers) - Start receiving your Appliance Repair Leads in 3 to 7 Days! Average Time 72 hours once you turn it on. Don't worry we show you how. Fully Automated Lead Generation Machine - Turn it on when you want leads. Turn it Off when You Don't or Speed it Up or Slow it Down. NO More Contracts... Ever!! - Stop spending your hard earned money on wothless contracts. **Bonus #1 ** Book More Appointments Blueprint - Turn 85% to 90% of those New phone calls into Appointment & paying satisfied customers. NOTE: Our Secure Payment Processors are Stripe & Paypal - You DO NOT need to have an account with "Stripe" & "Paypal" to use them. They are the companies that we use to process our secure payments. They WILL process Debit & Credit Cards. If you have any questions please feel free to give us a call or contact us via email. All these Benefits are Just a Few Clicks Away! No questions asked, no hassels, no problems!